Over on the veneremurcernui blog you can find a great extended quote and commentary from Dom Gueranger that speaks of the times in which we live. It is worth the read. She was the daughter of Birger Persson, governor and provincial judge (Lagman) of Uppland, and of Ingeborg Bengtsdotter. Her father was one of the wealthiest landholders of the country, and, like her mother, distinguished by deep piety. 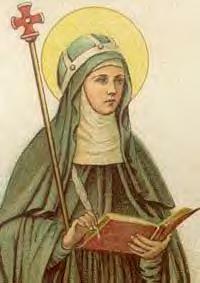 St. Ingrid, whose death had occurred about twenty years before Bridget’s birth, was a near relative of the family. Birger’s daughter received a careful religious training, and from her seventh year showed signs of extraordinary religious impressions and illuminations. To her education, and particularly to the influence of an aunt who took the place of Bridget’s mother after the latter’s death (c. 1315), she owed that unswerving strength of will which later distinguished her. Introduction: Brother Lawrence’s letters are the very heart and soul of what is titled ‘The Practice of the Presence of God’. All of these letters were written during the last ten years of his life. Many of them were to long-time friends, a Carmelite sister and a sister at a nearby convent. One or both of these friends were from his native village, perhaps relatives. The first letter was probably written to the prioress of one of these convents. The second letter was written to Brother Lawrence’s own spiritual adviser. Note that the fourth letter is written in the third person where Brother Lawrence describes his own experience. The letters follow the tradition of substituting M— for specific names. Please give Him thanks with me, for His great goodness towards me, which I can never sufficiently express, and for the many favors He has done to so miserable a sinner as I am. May all things praise Him. Amen. The apprehension that I was not devoted to God as I wished to be, my past sins always present to my mind, and the great unmerited favors which God did me, were the source of my sufferings and feelings of unworthiness. I was sometimes troubled with thoughts that to believe I had received such favors was an effect of my imagination, which pretended to be so soon where others arrived with great difficulty. At other times I believed that it was a willful delusion and that there really was no hope for me. Finally, I considered the prospect of spending the rest of my days in these troubles. I discovered this did not diminish the trust I had in God at all. In fact, it only served to increase my faith. It then seemed that, all at once, I found myself changed. My soul, which, until that time was in trouble, felt a profound inward peace, as if she were in her center and place of rest. As for what passes in me at present, I cannot express it. I have no pain or difficulty about my state because I have no will but that of God. I endeavor to accomplish His will in all things. And I am so resigned that I would not take up a straw from the ground against His order or from any motive but that of pure love for Him. My King is full of mercy and goodness. Far from chastising me, He embraces me with love. He makes me eat at His table. He serves me with His own hands and gives me the key to His treasures. He converses and delights Himself with me incessantly, in a thousand and a thousand ways. And He treats me in all respects as His favorite. In this way I consider myself continually in His holy presence. My most usual method is this simple attention, an affectionate regard for God to whom I find myself often attached with greater sweetness and delight than that of an infant at the mother’s breast. To choose an expression, I would call this state the bosom of God, for the inexpressible sweetness which I taste and experience there. If, at any time, my thoughts wander from it from necessity or infirmity, I am presently recalled by inward emotions so charming and delicious that I cannot find words to describe them. Please reflect on my great wretchedness, of which you are fully informed, rather than on the great favors God does one as unworthy and ungrateful as I am. Distrust yourself and confide in God, and thus distrusting and thus confiding, between fear and hope, you shall work out your salvation in the spirit of the Gospel. 68. Let us consider the things of this world in which we are apt to take a vain delight. Onc may pride himself on his robust health and bodily strength, another on the science, knowledge, eloquence andother gifts that he has acquired through study and art. Another prides himself upon his wealth and possessions; another upon his nobility and rank; another upon his moral virtues, or other virtues which bring him spiritual grace and perfection : but must not all these gifts be regarded as so many benefits proceeding from God, for which we must render an account if we do not use them to resist temptation and conform to the ordination of God? We are debtors to God for every benefit that we receive, and are bound to employ these gifts and to trade with them for the glory of God like merchants to whom capital is entrusted. When we consider how many benefits, both of body and soul, we have received from Him, we are compelled to admit that there are so many debts which we have contracted towards Him, and why should we glory in our debts? From the benefits we receive of God we should learn lessons of humility rather than of pride, following the teaching of St. Gregory: “The more strict the account that a man sees he must give of his duties, the more humble should he be in the performance of them,”. [Hom. ix in Evang.] Our desire to boast of the favours we have received of God only demonstrates our ingratitude, and we have more cause to humble ourselves for being ungrateful than to glory in the benefits thus bestowed upon us. O my soul, how dost thou stand in regard to this faithfulness towards God? Art thou not like those servants to whom their master daily entrusts money now to buy one thing, now another, and who each time keep back a small coin for themselves, until little by little they become unfaithful servants and great thieves? In like manner, our pride renders us unfaithful servants when we attribute to ourselves that praise which is due only to a gift that is entrusted to us by God and which ought to be ascribed unreservedly to Him. O Lord, Thou seest all my thefts and I am overwhelmed with astonishment that Thou dost still trust me! Considering my unfaithfulness I am not worthy of the smallest grace, but make me humble and I shall also be faithful. It is customary with men of the world to balance their accounts at the end of the year, and ascertain their profits. The Church is now preparing to do the same. We shall soon see Her solemnly numbering Her elect, taking an inventory of Her holy relics, visiting the tombs of those who sleep in the Lord, and counting the sanctuaries, both new and old, that have been consecrated to Her Divine Spouse. But today’s reckoning is a more solemn one, the profits more considerable: She opens Her balance-sheet with the gains accruing to Our Lady from the mysteries which compose the liturgical cycle. Christmas, the Cross, the triumph of Jesus, these produce the holiness of us all; but before and above all, the holiness of Mary. The diadem which the Church thus offers first to the august Sovereign of the world, is rightly composed of the triple crown of these sanctifying mysteries, the causes of Her joy, of Her sorrow, and of Her glory. Such is Mary’s Rosary; a new and fruitful vine, which began to blossom at St. Gabriel’s salutation, and whose fragrant garlands form a link between earth and Heaven. The Rosary was made known to the world by St. Dominic at the time of the struggles with the Albigensians, that social war of such ill-omen for the Church. The Rosary was then of more avail than armed forces against the power of Satan; it is now the Church’s last resource. It would seem that, the ancient forms of public prayer being no longer appreciated by the people, the Holy Ghost has willed by this easy and ready summary of the Liturgy to maintain, in the isolated devotion of these unhappy times, the essential of that life of prayer, faith, and Christian virtue, which the public celebration of the Divine Office formerly kept up among the nations. Before the 13th century, popular piety was already familiar with what was called the psalter of the laity, that is, the Angelical Salutation repeated 150 times (once for each of the Biblical Psalms); it was the distribution of these Hail Marys into decades, each devoted to the consideration of a particular mystery, that constituted the Rosary. Such was the divine expedient, simple as the eternal Wisdom conceived it, and far-reaching in its effects; for while it led wandering man to the Queen of Mercy, it obviated ignorance of the Faith, which is the food of heresy, and taught him to find once more “the paths consecrated by the Blood of the Man-God, and by the tears of His Mother” (Pope Leo XIII, Encycl. Magnae Dei Matris, Sept. 8, 1892). Soliman II, most powerful of the Sultans, taking advantage of the confusion caused in the west by Luther, had filled the 16th century with terror by his exploits. He left to his son, Selim II, the prospect of being able at length to carry out the ambition of his race: to subjugate Rome and Vienna, the Pope and the emperor, to the power of the crescent. 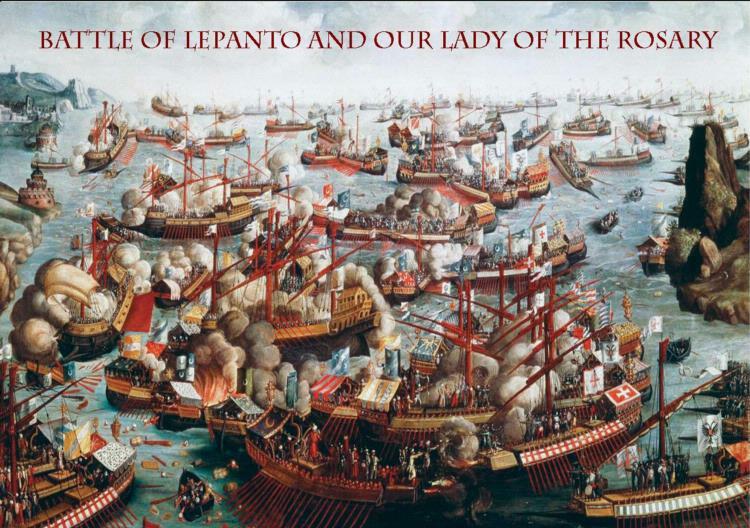 The Turkish fleet had already mastered the greater part of the Mediterranean, and was threatening Italy, when, on October 7, 1571, it came into battle against the pontifical galleys supported by the fleets of Spain and Venice. It was Sunday; throughout the world the confraternities of the Holy Rosary were engaged in their work of intercession. Supernaturally enlightened, Pope St. Pius V watched from the Vatican the battle undertaken by the leader he had chosen, Don Juan of Austria, against the three hundred vessels of Islam. At the sacrifice of many lives offered with great heroism, the outnumbered Catholic fleet utterly devastated the diabolical Turks. But Our Lady would not have Her victory end there. While the Muslim fleet was fleeing, She raised such a storm at sea, that only a small fraction returned to tell of their humiliating defeat. The illustrious Pontiff, whose life’s work was now completed did not survive to celebrate the anniversary of this glorious triumph; but he perpetuated the memory of it by an annual commemoration of Our Lady of Victory. His successor, Pope Gregory XIII, altered this title to Our Lady of the Rosary, and appointed the first Sunday of October for the new Feast, authorizing its celebration in those churches which possessed an altar under that invocation. A century and a half later, this limited concession was made general. As Pope Innocent XI, in memory of the deliverance of Vienna by General Sobieski, had extended the Feast of the Most Holy Name of Mary to the whole Church; so, in 1716, Pope Clement XI inscribed the Feast of the Most Holy Rosary on the universal calendar, in gratitude for the victory gained by Prince Eugene at Peterwardein, on August 5, under the auspices of Our Lady of the Snows. This victory was followed by the raising of the siege of Corfu, and completed a year later by the taking of Belgrade.